In everything we do, we strive to provide the very best football club we can, recognising that were it not for our fans we would not be here and without them there would be no point being here anyway. As fans ourselves we extend a welcome to you our visitors, which we hope is reciprocated when we visit your club. You will have a different view of the match and will hope for a different result, but both sets of supporters are united as football fans that have made sacrifices to support their clubs, and the commitment of all fans is recognised by this club. We could recommend a few pubs in and around Chelmsford that you might want to visit before the match but there's only the one place you should go to and that's The 'Clarets' bar - Chelmsford City's very own club house and bar, before the match. 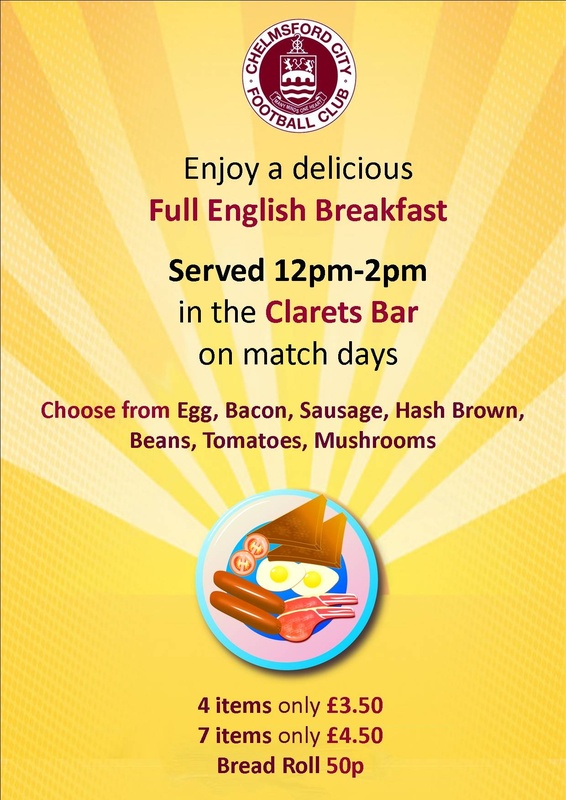 On a match day the bar is open from 12pm with a full English breakfast on offer from as little as £3.50. Bar prices are very reasonable, currently £3.20 a pint and there is a fine selection of real ales and ciders. Baguettes are available at the bar and the atmosphere is quite amiable as well! On the concourse there is also a very well stocked burger van offering chips, hot dogs and burgers. There is a 100" big screen, along with two other smaller ones showing football from either Sky SportsHD or BT SportsHD and free WiFi. Visiting Melbourne Community Stadium - There are a small number of parking spaces on matchday located at the centre, and limited parking is available on street, so we would ask where possible for visiting fans to make use of their own coach services. If travelling independently we would ask you to consider the public transport options listed below. If you do have to drive to the venue, we ask you to show consideration to our neighbours when parking around the stadium. Melbourne Park is a no smoking stadium, however there is a designated smoking area on the hard-standing outside of the main clubhouse. The clubhouse is open before, during and after the game for refreshments. Public transport - Chelmsford Railway Station is served by the London Liverpool Street to Ipswich main line. In order to make a 15:00pm Saturday kick-off the latest train you should catch from London Liverpool Street by no later than is 12:45pm to comfortably make kick-off and the same applies from Ipswich. To make a midweek 19:45pm kick-off, leave London Liverpool Street by no later than 18:15pm and Ipswich by 18:00pm. Travelling by bus - The number 54 and 56 buses run a regular service every ten to fifteen minutes, departing from the Bus Station, which is situated on the left hand side of Duke Street just after the viaduct. Your journey should take around fifteen minutes from this point. There is a Taxi Rank at the rear of the station. We look forward to welcoming you to our Club and hope your stay (if not the result) is pleasurable.